First, the bottom line. In each of the two North Korean tests in July, the rockets were fired on a trajectory that sent them to high altitudes; on these trajectories, the rockets travelled relatively short horizontal distances. But after the tests, analysts projected the maximum range the rockets could have traveled by assuming that they could have been placed on trajectories that would result in a maximum achievable range, rather than a maximum achievable altitude. For example, the 2,720-kilometer altitude achieved by the July 3 rocket was determined by its burnout speed. If it is assumed that the rocket could achieve roughly the same burnout speed on a trajectory that is shaped for maximum range, it would be sufficient to carry the payload to Anchorage, Alaska. Figure 2. 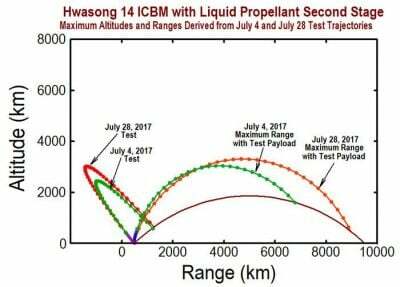 The analysis results summarized in the graph are for two different “designs” of the Hwasong-14. Atomic bomb weights—without the hype. At this time, no one outside of North Korea has solid information about the characteristics of North Korea’s nuclear weapons designs—especially about whether or not the weapons that have been tested are cumbersome laboratory devices or readily militarized designs that could be put into bombs or carried on ballistic missiles. This information is simply not available at this time. We are therefore left to speculate based on intelligence information that we have from other sources and on an understanding of the very significant technical problems of design and implementation that must be solved to be able to build and deliver atomic bombs by ICBM. There is general information about an atomic bomb design that was obtained by Pakistan from China, and by Libya from Pakistan. A.Q. Khan, a Pakistani known to have trafficked equipment and information that would facilitate the building of atomic bombs, is reported to have sold that design to Libya. Khan is known to have sold uranium enrichment gas-centrifuge technology to North Korea; it is very likely he also shared atomic bomb design information similar to what he sold Libya. It is reported that the bomb design Khan sold to Libya and possibly to North Korea would produce a warhead that weighed about 500 kilograms and yielded about 10 kilotons, if properly implemented. All of the original design information from China was for devices that were aimed at assembling uranium 235 cores. This information could have been modified and used by North Korea to implement similar implosion devices to instead assemble plutonium 239 cores. However, these devices would have had to be developed and modified from the original designs. This information is consistent with the seismic data from Pakistan’s nuclear tests in 1998, which suggest that the yield of atomic bombs tested by Pakistan is between 10 and 15 kilotons. It is also consistent with the seismic data from North Korea’s nuclear tests, which indicate maximum explosive yields of perhaps 10 to 20 kilotons. North Korea has publicly displayed what it claims to be a standardized atomic bomb that dimensional analysis indicates could weigh as little as 400 kilograms. The device displayed by North Korea is clearly a spherical implosion design—seemingly based on the same design concept that Khan sold to Libya and used by Pakistan. (If North Korea had instead sought to impress the outside world by displaying an atomic bomb that was shaped somewhat like an egg, it could have indicated an entirely different and far more advanced design.) But the payload of a missile consists of more than a warhead. Because of the extreme environments created by long-range missile reentry to the atmosphere—including temperatures in the thousands of degrees and high deceleration forces—we have assumed that 25 percent of the payload-weight of these North Korean rockets would have to be given over to a heat shield and the structure needed to hold an atomic bomb in place during deceleration. This is an intentional underestimate of the weight of the warhead assembly, to make our assessment of the Hwasong-14’s capabilities as favorable to North Korean capabilities as possible. In this extremely conservative estimate, and as a result of a review of the very sketchy information about nuclear weapons design information that has leaked from China to Pakistan and beyond, we think that a reasonable guess for the minimum weight of an advanced first-generation weaponized North Korean atomic bomb that is able to survive the extreme environments associated with ICBM delivery could be as low as 500 to 600 kilograms. In our view, the engineering challenges of implementing a nuclear weapon are substantial and highly dependent on material resources, national experience, and the skill and depth of knowledge of scientists, engineers, and technicians involved at every level of the enterprise. As such, it cannot be ruled out that a North Korean weaponized device could weigh considerably more than 600 kilograms or less than 500 kilograms, but we believe it is overwhelmingly likely that it would not weigh less than 500. Our estimates show that the Hwasong-14, using the publicly reported burn times for the upper rocket stage, could deliver a nuclear warhead only as far as Anchorage, Alaska if the warhead weighed 500 kilograms to 550 kilograms. To reach Seattle, the warhead would have to be substantially smaller, weighing no more than 300 kilos. We believe that an advanced North Korean weaponized atomic bomb would be unlikely to weigh less than 500 to 600 kilograms. So it is entirely possible that this variant of the Hwasong-14 will not be able to deliver an atomic bomb to Anchorage, Alaska. If the upper stage of the Hwasong-14 were instead fitted with the more capable vernier motors from the SS-N-6 submarine launched ballistic missile (known in Russia as the R-27), it could potentially deliver an atomic bomb to Anchorage, if the bomb weighed less than between 650 and 750 kg. The same upgraded variant of the Hwasong-14 could only deliver an atomic bomb to Seattle if the bomb weighed less than between 400 and 450 kg. Since it is extremely unlikely that a first-generation weaponized North Korean atomic bomb would weigh substantially less than 500 kilograms, we conclude that neither variant of the Hwasong-14 missile could deliver a first-generation North Korean atomic bomb to the continental United States. Performance assessment of the Hwasong-14. Like any missile system, the actual lifting and range capability of the Hwasong-14 depends on many technical details. Among these are the type of fuel burned by the missile, the efficiency of its rocket motors, the total amount of propellant carried in each stage, the weight of the missile’s airframe, and the weight of different components, including rocket motors, plumbing, guidance and control systems, and the like. Figure 3 shows photographs extracted from North Korean videos of the launches of the Hwasong-14 missile during the morning of July 4 (in North Korea; the evening of July 3 in the United States) and during the night-launch on July 28. Careful examination shows that the first stage of the Hwasong-14 is powered by a large single rocket motor supported by 4 small “vernier” motors that are used to change the direction of the rocket during powered flight and to maintain its vertical stability during its initial lift-off and vertical acceleration. North Korea has also released videos of tests of the Hwasong-14 rocket motor (shown firing on a test stand in Figure 4).